As usual in the days leading up to Lollapalooza, which takes place Friday through Sunday in its eighth year in Grant Park, the Chicago media has been in full-on hypemaster mode, with a particular emphasis on repeating promoters’ claims that there won’t be an encore of the trashed grounds that took months to clean up in 2011, or the massive onslaught of freeloaders crashing the gates and trampling everything in their path—flower beds as well as paying customers. Here is Thomas Conner and Fran Spielman in the Sun-Times and Chuck Sudo in Chicagoist, to cite a few of the many recent stories repeating Texas-based promoters C3 Presents’ promises of more fencing and security, both to protect the park and to keep the non-paying customers out, complete with Chicago Park District Superintendent Michael Kelly and Bob O’Neill of the watchdog group the Grant Park Conservancy cheerfully saying that this year, everything should be swell. Stopping the fence-jumpers is no easy task, however. Last year, some of the groups that rushed the gates numbered 75 people or more, overwhelming security, according to this story in the Tribune and numerous other accounts. This created a situation that was unsafe for people inside legitimately, as well as for the uninvited guests scamming/forcing their way in: At least two were seriously injured in 2011 when they were hit by a car while dashing across Lake Shore Drive. 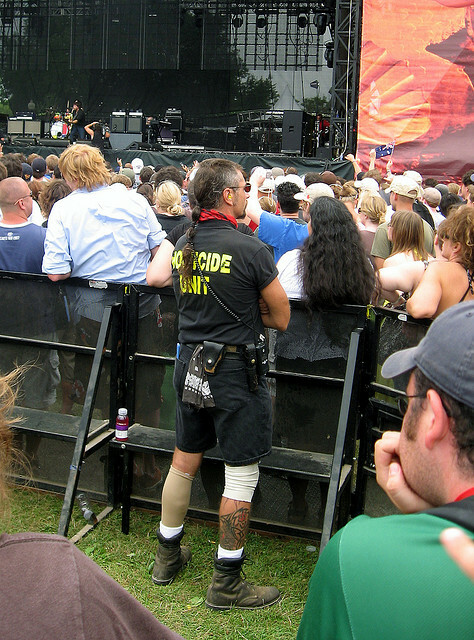 Security guards who worked the concert—the majority come from the local company S3 or Safety Systems Services, which works for and partially is owned by Chicago concert mainstays Jam Productions—told me they saw concertgoers trying to climb up the railroad trestle at the southern end of the park near Hutchinson Field (“These kids would have broken their necks if they fell!”), as well as doing the flash-mob rush at the northern end of the park near the Art Institute. Nevertheless, Lollapalooza has a contractual lock on Chicago’s front yard—and not just through 2021, as the Sun-Times reported, but in perpetuity, given that the promoters and the city can extend the new deal annual forever, as reported here. And nobody seems to mind, least of all the group that traditionally voiced its objections to anything that took the very public park private, even for a short time. That last question may be the thorniest, given that Lollapalooza for the first time will be paying its full freight on amusement taxes—to the city, and not to the (now non-existent) Parkways Foundation parks charity. Where will the money go from 2012? Nobody has said for sure yet, but there are many more pressing demands than new flower beds and benches in the midst of a budget crisis. Meanwhile, more soothing but none-too-illuminating words are likely to be spoken at another meeting tonight, when Michelle Boone, Commissioner of the Department of Cultural Affairs and Special Events, and Angel Ysaguirre, her new deputy in charge of arts programming, talk about the much-ballyhooed Cultural Plan, no doubt for the first time being pressed on music therein—a natural, given that the session is being hosted by Grammy sponsors the Recording Academy (and taking place from 6 to 9 p.m. in the Grand Ballroom of the Sofitel Chicago Water Tower, 20 E. Chesnut. The discussion will be moderated by Chicago music journalist Althea Legaspi, and it’s free for Recording Academy members but $25 for the rest of us. Tickets can be reserved here.